Remind someone of their favorite tropical vacation...send this mix of hot-colored blossoms in an oceanic blue glass cube vase, and bring a bit of calypso magic to brighten their day. Its a sizzling summer treat! 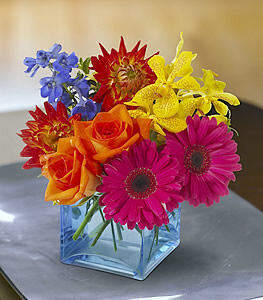 Hot pink gerberas, orange roses and bi-color dahlias, yellow miniature carnations, yellow Mokara orchids and blue delphinium -- accented with seeded eucalyptus and oregonia -- are delivered in a square ocean blue vase.